We provide all types of concrete services for all your residential and commercial applications. This ranges from typical grey concrete flooring installations, to more upscale and decorative stamped concrete designs. We are local licensed concrete contractors with the knowledge and skills to complete any size job, big or small. Check out our stamped concrete page for more info on all of our concrete pouring options. Concrete pavers have become increasingly popular over the last few years. Concrete pavers are an excellent alternative to most of your exterior flooring applications wether it be a driveway, walkway, or patio. There are many textures, colors and patterns available to choose from. It can be a bit overwhelming to make a choice at times. We at VenCo Concrete understand this, and we are here to help!! Our team of installers are well versed in the installation of any style of pavers for your residential or commercial needs. 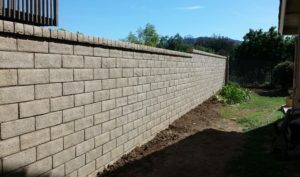 If you are considering building a privacy block wall or retaining wall, there is a lot of careful planning and decision making that goes into the process. Everything from choosing the proper materials and wall design, to engineering and building permits. If necessary we will gladly walk you through the entire process. After all, that’s our job! We are masonry block layers with excellent workmanship and 30+ years of experience. We will complete any size job while following all applicable building codes and regulations. Ventura County area homeowners, business owners, and industrial property owners stop. Think about it for a second. Name three projects on your building or home’s to-do list. It’s sure to have a patio, refinished driveway, foundation work, or retaining walls on it. Whether you need new concrete work, refinishing, or repairs, VinCo does it all. The services that the company offer are extensive. They can pour and lay conventional concrete driveways, stamped concrete walkways, patios, and pavers. The work they do is expansive and includes even more complex projects as masonry and stone work, retaining and block walls and foundations. Along the same, their skilled masons are able to make fire pits and barbecues. Another specialty most people give little thought to includes the deconstruction of buildings. Demolition services include more than rolling out the wrecking ball. It is a time to collect materials out of the buildings that have resale value. Stripping then knocking the building down is the most effective way to go. Reach out to the team at VinCo for more information on how they can improve the demolition process for your project. When it is time to build, VinCo helps get the hands-on building process rolling with its foundation services. Their collective concrete services for homes and businesses run the gamut from plain and sturdy concrete flooring up the line to decorative concrete that’s been stamped with imaginative and beautiful designs. With more than 30 years as licensed professional concrete contractors, they have answers and know-how that lesser experienced professionals have not yet discovered. VinCo is an easy choice for its beautiful finishes, quality results from locally licensed concrete contractors. They have the tremendous depth of skill and knowledge to take on stone, masonry, and concrete as well as demolition work. Whether you need a small concrete bad to install posts for a deck, or need a whole concrete floor for a multi-acre commercial site, VinCo is capable of handling the job. It’s really impressive what they can do with concrete. Concrete pavers are increasingly stealing the hearts of customers everywhere. They create a finished look while providing an excellent option for driveways, patio spaces, and pathways. Part of their popularity is attributed to the breadth of options from which to choose. Look at not only the variety of colors but also be sure to consider the many different textures and patterns that are available today. The value to customers is that VenCo has such a breadth of experience they are often able to provide advice on what colors or textures will work best for an outdoor space. It’s a little-known fact, but always as the contractor for their opinion on what may work in a space. Often they can tell you the horror stories of what was a visual fail, as well as the successes. Of course, choose the successes to make sure your project provides lasting beauty that complements your home or building. Anyone who has been in business for 30 years has surely seen the customer who insisted on installing a schema that did not work well together. Go with what they say to achieve better looks and better functionality. The knowledgeable professionals at VinCo are capable of installing any type of paver. They stay on top of the ever-changing methods that are always being added to the market. Though, the paving team is also very experienced and capable of performing more traditional installations as well with tampers and sand. Lots of times building a retaining wall finds business owners or homeowners at their wit’s end. They may be forced to build to protect the integrity of their property from sliding or shifting. It’s important to focus on the quality of the project and the experience level of the professionals who will be building the wall. Building retaining walls involves a good deal of planning and coordination of professionals. It is deceptively hard. They can use various materials to achieve the purpose the retaining wall will play according to the natural landscape that is found on your property. In some cases, the concrete paving contractor will have to work with engineers and architects. It depends on the height of the wall and local building codes. Retaining walls come in a few manners that employ different concepts. Battered and anchored are just two styles. The good fortune of having concrete and stone masons on your side means that they have many different materials to add to the mix to provide the strength and stability you desire along with the look you want to achieve. Having to pull in additional professionals can add to the time line for the project, as well as to the cost. VinCo is fantastic at communicating when there are more requirements to meet before building a retaining wall. The retaining wall will keep the land in place. Additionally, an excellent way to introduce privacy without sacrificing beauty is achieved by building block walls. Building block walls are beneficial because they use one of VinCo’s specialty focal points — concrete. The concrete walls can be reinforced with rebar and filling in the concrete block holes to make them stronger. Sealers and special concrete block bolts also ensure that the wall will have a long life on the property. It’s complicated choosing what to include in the wall. There are many details to include that are directed by the purpose and desired height of the wall. VinCo. walks clients through the process of choosing materials and designs to achieve a stable and secure wall that has the right style. They are experts in guiding clients through the process, including working out the engineering details and pulling building permits. While VinCo has an exceptional track record serving homeowners and businesses throughout the area, they want future customers to see the results of their efforts. They offer up a full library of images that showcase the extent of their expertise and their experience. Actually, a lot of future customers get their inspiration for their next home project from VinCo’s gallery. After all, you know the masons and talented concrete contractors who are able to make the patio, driveway, walls, and pathways of your dreams take shape. Meanwhile, customers have been recommending VinCo to their friends and family for years. Word of mouth appears to be their best form of advertising and flattery. It’s all true, and it is promising for anyone looking to get the functionality and look they want to achieve. VinCo is up to the job whether it is an immense commercial project or a smaller home project. It’s no wonder customers love them so much. With more than 30 years of exceptional results in a challenging trade as masonry and stone work, it is no wonder people turn to VinCo for all their needs. Even more than that, they are able to pour foundations, stamp flooring, and make it take many shapes and forms to achieve different looks. That’s the beauty of concrete these days. Can You Afford Not To Hire VinCo? They have excellent testimonials on their site. That’s great and all, but they have one even better: glowing online reviews. They are real reviews that provide information that’s helpful to customers. How long does it take for VinCo to show up for appointments and to return calls? What kind of exchanges do they have with their customers? Are they polite and professional or not? It turns out that they are known for arriving as scheduled, returning calls like a normal person, and even offering one more great perk to potential customers. They somehow tend to have some of the most competitive and lowest rates in the industry. How Do They Charge Less? Here’s how that potentially works. When a company has such exceptional professionals that they typically only have to do the job one time to get it right, it costs less. Even if they are technically higher echelon professionals, they are able to work more efficiently and effectively than those companies with masons and concrete workers with less experience. What’s a true demonstration of their professionalism is that they are able to meet pretty tight deadlines even with the permit process in the flow of the project. VinCo has a talented stable of licensed concrete contractors to build everything concrete, stone, or brick. Look to them to provide quality work and appealing results. Look to them for help with how to envision styles that will work for your home and business. It will improve your daily life while beautifying the space. It takes tremendous know-how and skill to understand how to make walkways, driveways, pathways and walls. To make them take form with the precision necessary to stand up to the test of time, it takes the experienced professional licensed concrete contractors at VinCo. They are the area’s top choice for concrete work.